Low elevation runs are accessible all the time. 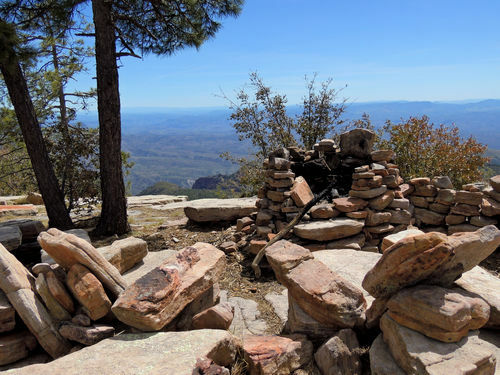 High elevation roads may be closed in the winter. ​There is a GPS - gpx file at the bottom of the page. 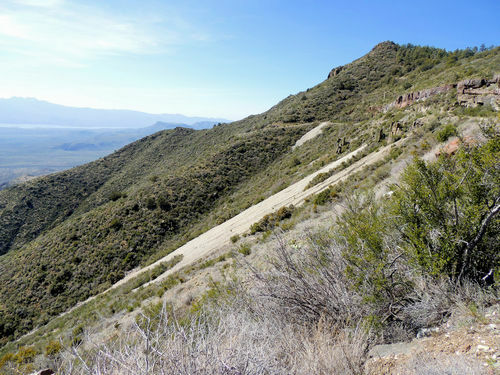 Angle Wings were formed by tailings from asbestos mines on the American Ores claim. 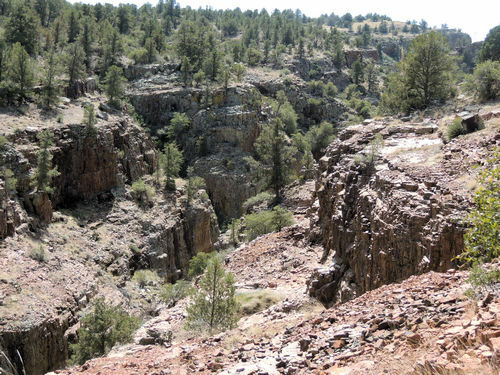 Information from the Arizona Mines and Minerals Resources indicates there are 32 contiguous claims established by Charles Watkins in 1915. Mines were active until 1927, then ceased production until 1947. There was a varying level of activity up to the early 1960's. Read this pdf file for more information. 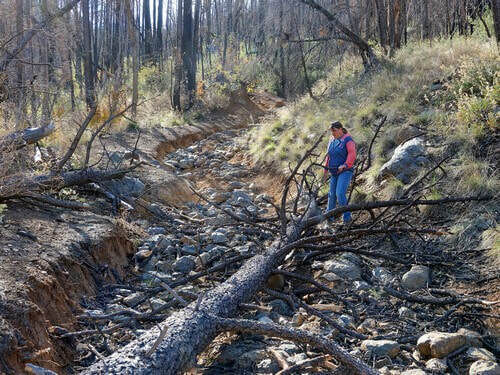 ​The road up to the mines is through heavy timber with recently burned areas in the upper section, and can easily be blocked by burned trees blown down or washed into the trail. 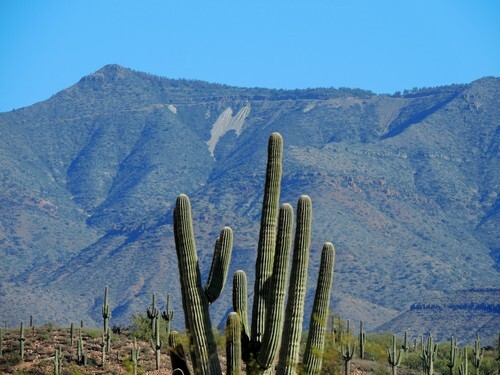 Take a chain saw if you want to be sure you can get to the top. 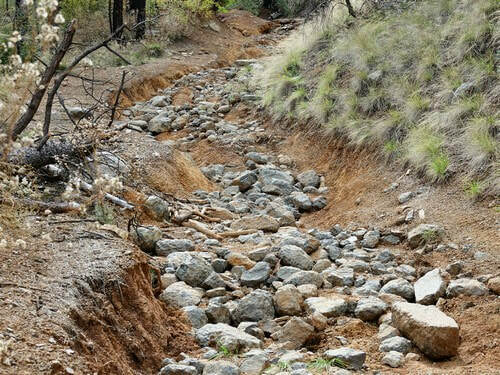 The lower part of the road washed out in 2016 but has been repaired as of 2018. The upper part has been washing for years and has not been repaired. The rebuilt road starts out easy for the first mile. After that the trail is more difficult and you may find down trees. 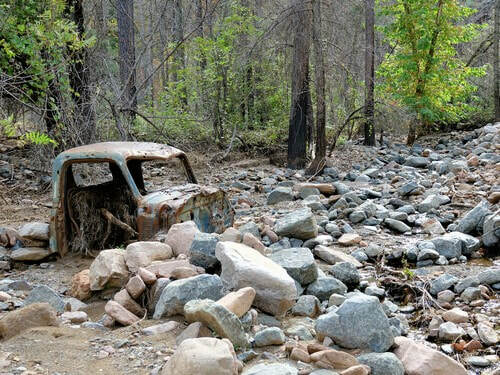 The repaired road ends at an old gauging station and abandoned truck in Pocket Creek, and a waterfall on a side canyon of Pocket Creek. There is a boulder area and a narrow, tippy spot just above the repaired section. The upper part of the trail is a strong 3.0. A lot more boulders and quite a bit of gullying. Fun for a well equipped Jeep. 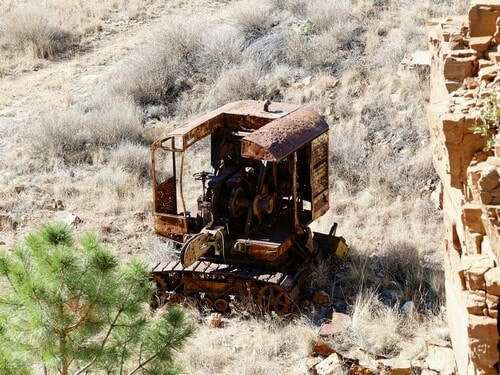 We discovered one piece of abandoned equipment and the remains of one or two structures. It is easy to see which mines the Angel Wings came from as you drive toward them. The openings are directly above the wings. You should stop driving at the top of the first wing. The road is passable beyond this, but there is no room to turn around. 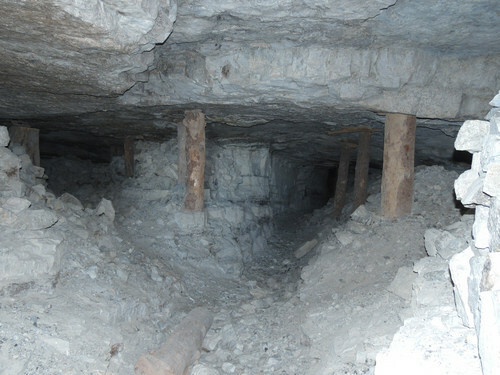 There are numerous mines that are open for inspection, but these two are the easiest to access. 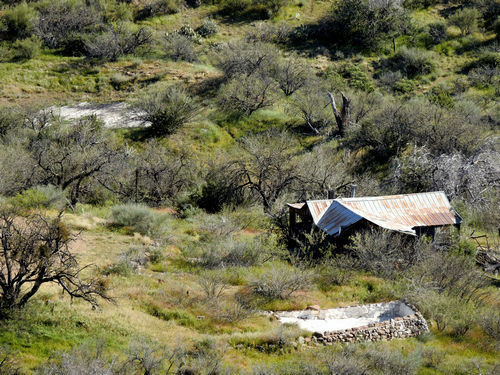 Health officials will warn you to stay completely out of the mines because of the risk of asbestosis. Probably a good idea. We went into these two mines only far enough to snap a few photos. 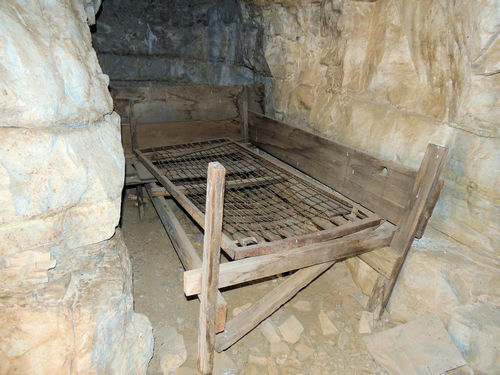 Bed inside mine above second wing. 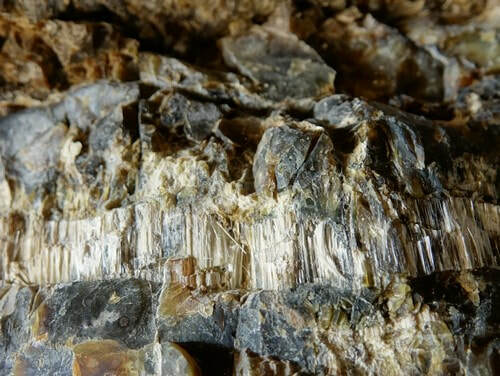 There are thin veins of asbestos ore remaining inside the mines. Great view for lunch! 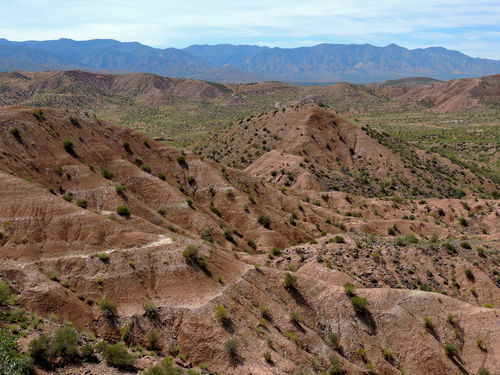 A 2.0 rated track takes you on the west side of a beautiful canyon. 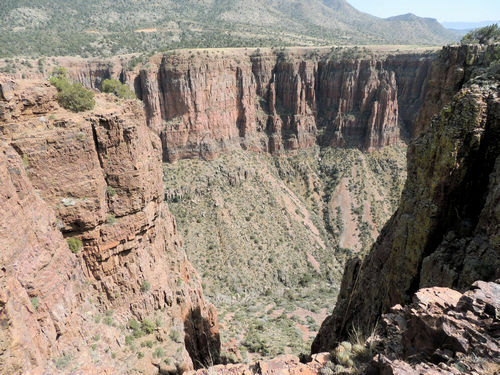 It is also access for hiking trails down into the canyon. There is a spot about a quarter mile from the Young Road that approaches a 2.5 rating. 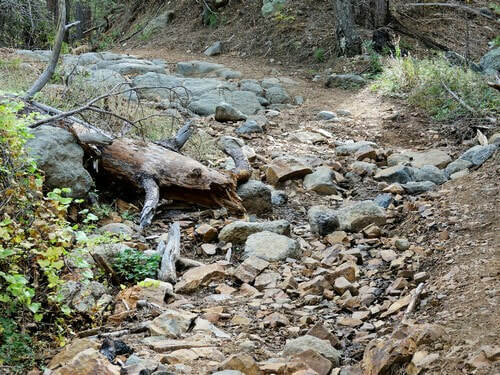 This is the most difficult part of the trail. 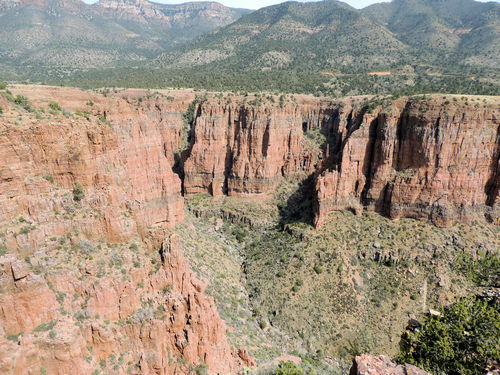 You can look down into Upper Parker Canyon as you drive the road. There is a great viewpoint at the end of the road. 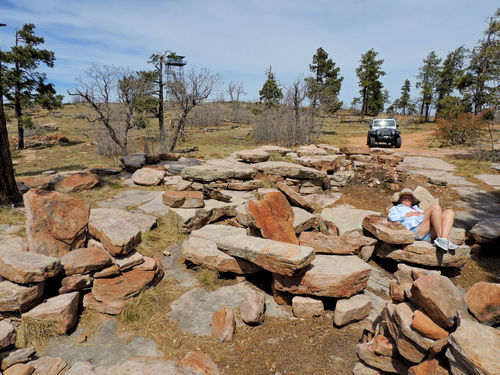 Park at the viewpoint and walk toward Lower Parker Canyon for awesome views down into it. There is also a short 2.0 road on the east side, but it is not nearly as nice. You will see this house as the Young Road starts to climb toward the mountains. 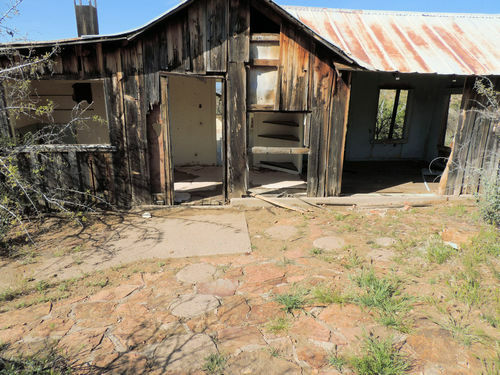 Must have been quite a house in its day - a swimming pool, flagstone patio and a fantastic view right in the middle of nowhere. There is a 2.0 road down to it. 2018 update: House has been removed but pool remains. 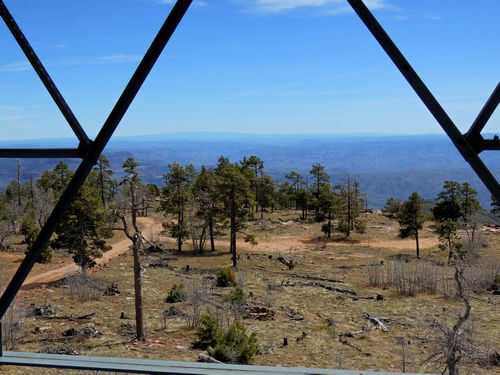 Aztec Peak trail is an easy road to a fire tower at the top of a 7,748' mountain. 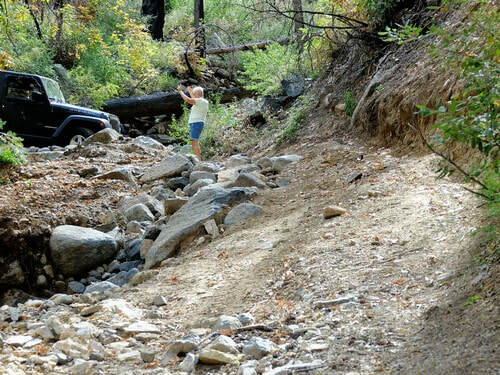 The road follows Workman Creek while accessing several Forest Service recreation areas and trail heads. Almost any vehicle can do this road. There is a Forest Service gate part way up the trail that can be closed when snow blocks the road. A couple people from the area told us the gate is left open when the road is open. 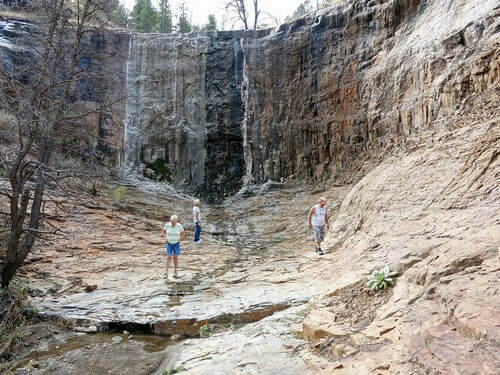 Workman Creek Falls can be spectacular when there is a heavy flow of water. Below the waterfall, Workman Creek is stocked twice a year during the early part of summer. Above the falls, the creek supports a small naturally-reproducing population of rainbow trout. There are no native fish found in Workman Creek at this time. 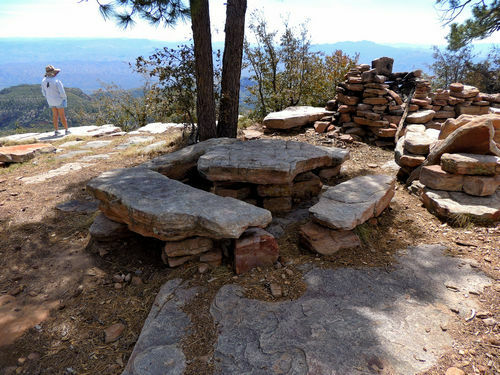 You will find "Flintstone Village" just before you get to the tower. 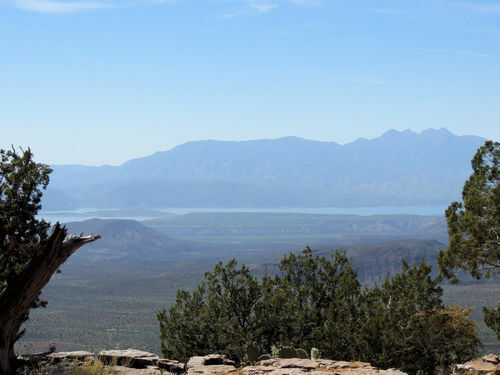 A-Cross Road is an easy 25-mile drive through the beautiful country north of Roosevelt Lake. 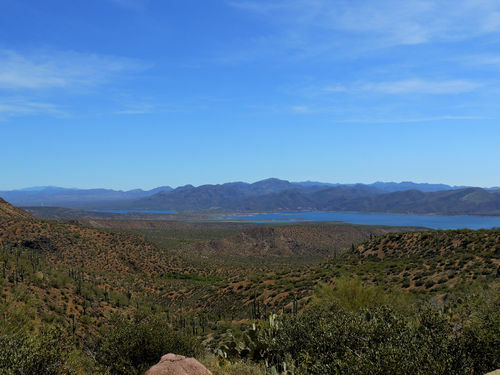 There are wide open views of Roosevelt Lake and the Sierra Ancha Mountains for the entire length. One area of very erosive soil near the west end. A graded road that is suitable for any vehicle. 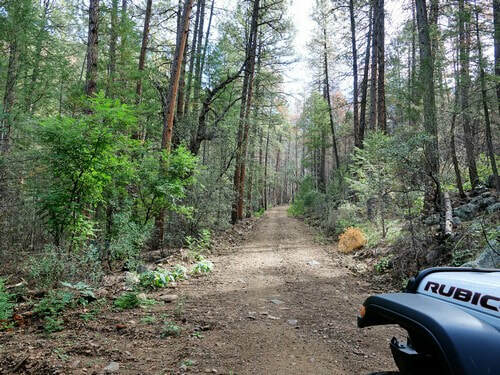 A fairly easy road to an old cabin at the edge of the Sierra Ancha Wilderness. 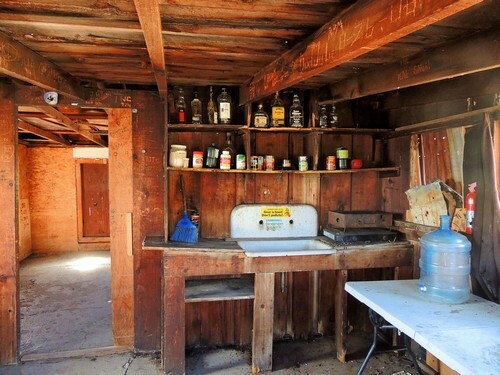 The cabin is in good shape and even has a few canned goods and (empty) booze bottles. 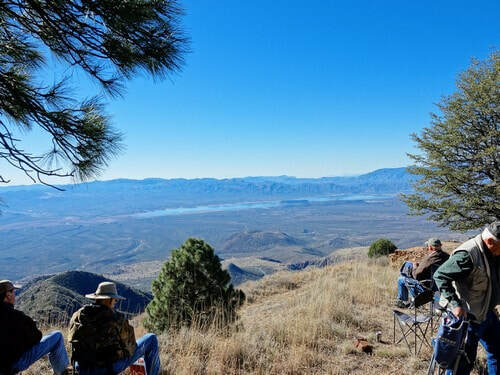 You can take a spur road on the way in to an overlook of the Salt River Basin. Interesting if you have time, but probably no better than what you see from the Young Road. 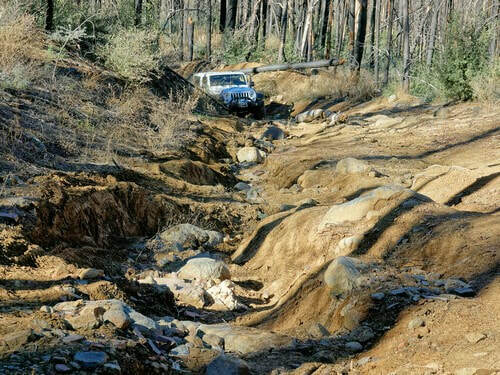 The second spur road appears to have been recently (as of 2016) worked to act as a firebreak. One side of an old road has been scraped and the brush and lower tree branches have been cut, probably to make a defensible firebreak. 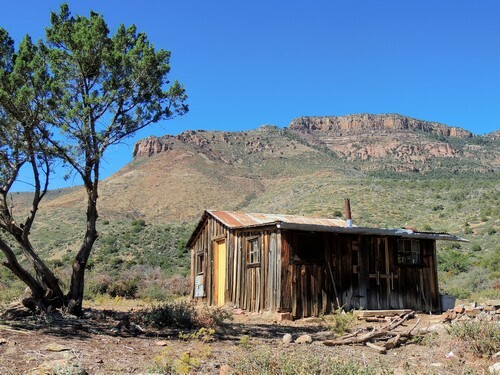 ​The road goes only a short distance beyond the cabin and dead ends at the Wilderness boundary.